While IoT connected vehicles and driverless cars have been drawing all the buzz lately in automotive world, the automotive aftermarket industry segment is witnessing a fundamental shift subject to changing consumer preferences regarding vehicle repair, service accessibility, and component purchase. In fact, the automotive industry generates only 37% of their overall revenues through initial sale of a vehicle whereas the remaining 63% is made from the automotive aftermarket. For a long time now, the increasing shelf life of vehicles has positively influenced automotive aftermarket trends. The overall vehicle population has been growing continuously over the years. While the average age of a vehicle in 2002 was 9.6 years, in 2015, it was estimated to be 11.5 years. This is mainly because of the improved vehicle production quality and consumers inclined to hold on to their vehicles for long. In consequence, this fact has resulted in an increase in the maintenance and replacement of automotive parts propelling automotive aftermarket industry growth. It is estimated that the number of vehicles more than 12 years old and still possessing proficient driving potential will see an increase by 15% over 2016-2020. This will impact the future trends of the automotive aftermarket, as these vehicles will require improved maintenance & services and essential accessories. Thus, the ageing vehicle fleet will continue to create new opportunities for automotive aftermarket over time. Aftermarket suppliers need to come up with innovative ways for routine vehicle maintenance. Vehicles that have a long shelf life and the potential to still be driven over long distances represent huge growth opportunities for dealers and service centers, thereby propelling automotive aftermarket. Many professional channels are providing advanced services and facilities such as discounted service, pick and drop, and superior quality accessories. This has resulted in a consumer satisfaction level of over 85%, which is likely to further stimulate automotive aftermarket industry trends. E-tailing is an online retail avenue that is growing at a fast pace in automotive aftermarket and is on the verge of becoming a significant revenue stream for accessories and auto parts sales. E-tailing provides access to various websites for service professionals as well as DIYers. DIY is a channel bursting with unique vitality, positively trending amongst the younger generation. This channel is also significantly driving the automotive aftermarket due to the availability of easy component installation guides, tutorials, and the overall cost-effectiveness. Such channels, through their online portals, are also into solving consumer queries, resulting in tremendous popularity of this segment. The easy access to the internet and myriad digital marketing platforms has opened a bag full of opportunities for automakers, paving ways for direct marketing and enhancing client service relationships. Many online players have found a taste of success in automotive aftermarket industry by targeting consumers frequently requiring spare parts and new features. Moreover, today’s digital savvy buyers prefer conducting self-research and have an opinion of their own, owing to which they no longer rely solely on sale via retail outlets. This trend has also positively drawn intensive traffic on the manufacturers’ websites, thereby enhancing online automotive aftermarket sale. Manufacturers need to take complete advantage of the traffic on their sites, change their strategies suitably to generate revenue, and build a closer connection with their customers. Considering that there is a fair percentage of consumers visiting manufacturer websites, there seem to be huge growth opportunities for automotive aftermarket players to flourish. Experts predict that changes in both, consumer behavior and technology are on the horizon. Rising global vehicle sale has boosted OEMs to accelerate and double their production volume. With the vehicle demand rising in new areas across the globe, automotive aftermarket parts need to be distributed and exported to new locations. Owing to this pressure, OEMs are likely to standardize their vehicle components, where they can supply the same product worldwide. Also, these automakers are selling more parts online and emphasizing on expanding their supply & distribution channels to manage the soaring demand. The top OEMs in automotive aftermarket are likely to increase the usage of global platforms to advertise and sell their products and work on modular architecture, which will provide standardization and greater flexibility. Modern technology upgrades and demand for ecological vehicles has also driven automotive aftermarket, owing to the rise in the sale of spare parts such as electronic chips and catalytic converter, which help improve fuel consumption for older vehicles. Buyers are always keen to embed new features to modify their older vehicles. This trend will result in an increase in the customer base of automotive aftermarket industry. 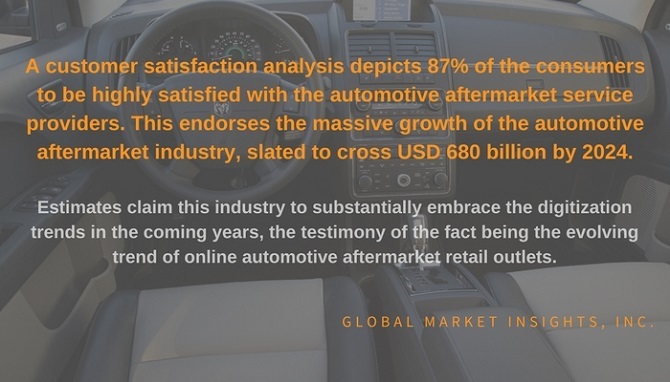 The trends of automotive aftermarket reflect evolving preferences of the buyers in the areas of connectivity and automobile purchase. Moreover, it is also an indication for automakers, retailers, and suppliers to adopt new business models to secure their future customers and revenue. Automotive aftermarket players need to focus on inventory selection & control and invest more to expanding their service networks. The President & CEO of Aftermarket Auto Parts Alliance, John Washbish, has also indicated that inventory control and management is likely to get even more complicated in the future. As the world switches to online sale and purchase, customers will want automotive parts in 30 minutes or even less. Doing so requires continuous engagement with clients through the management of supply chains. It is certainly no easy task to keep up with the proactive approach of this competitive industry. However, successful capitalization on market transformations will offer tantalizing rewards for automotive aftermarket industry over the years to come. Global Market Insights, Inc. has a report titled “Automotive Aftermarket Size By Vehicle Part (Replacement Parts [Belt, Brake, Clutch, Lighting, Electrical, Engine & AC, Exhaust, Filters, Suspension, Transmission, Wiper], Accessories), By Sales Outlet (Professional [Garages & Service Stations, Automobile Dealerships, Government], DIY, OEM), By Region (U.S., Canada, Germany, UK, Russia, China, India, South Korea, Japan, Indonesia, Thailand, Brazil, Mexico, Argentina, South Africa, GCC), Industry Analysis Report, Regional Outlook, Application Growth Potential, Price Trends & Forecast, 2016 – 2024” available at https://www.gminsights.com/industry-analysis/automotive-aftermarket .